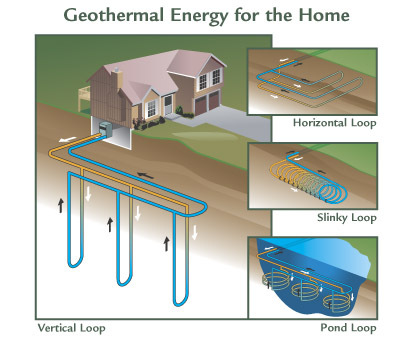 There are several types of designs that can be used in a geothermal system, all being either a closed loop or an open loop design. Both closed and open loops are designed to transfer stored solar energy from the ground back to the geothermal system in the house. 2) Resistance of the pipe to heat transfer. Of the two factors, pipe resistance is the dominant one. But, while little control can be exercised over source resistance, a great deal of influence can be exercised by the designer over the pipe resistance. Plastic pipes are generally poor conductors as compared with metal. Increasing the ratio of pipe surface area to trench length yields significant gains in loop performance. A closed loop is one in which both ends of the loop’s piping are closed. No matter what type of closed loop design is used, the process is the same. An antifreeze solution is circulated through plastic pipes (specifically, polyethylene PE 3408, SDR 11) buried beneath the earth’s surface. The antifreeze is recirculated over and over and no new water or fluid is introduced to the loop. The heat is transferred thru the walls of the piping to or from the source, which could be ground, ground water, or surface water. As heat is extracted from the water in the loop the temperature of the loop falls and the heat from the source flows toward the loop. During the winter, the fluid collects heat from the earth and carries it through the system and into the building. During the summer, the system reverses itself to cool the building by pulling heat from the building, carrying it through the system and placing it in the ground. In closed loop operation water quality is not an issue because corrosives become rapidly “spent” or used up and corrosion caused by poor water quality is quickly curtailed The wire-to-water efficiencies of circulators used in closed loop operation are very high and the costs of pumping the water are lower as compared to open loops. System efficiencies are somewhat lower in closed loop operation, but given the lower pumping costs associated with this method, economics sometimes, but not always favor this approach. Installed costs, however, are higher and need to be considered if the consumer already has a well or other water source. Vertical loops are primarily used when land area is limited or where soil and rocks don’t permit horizontal loops. Holes are drilled at depths of 150 – 200 feet and U-shaped piping is inserted. The holes are then backfilled with a grouting solution. In vertical loop installation, deep holes are bored into the ground and pipes with U-bends are inserted into the holes, the holes are grouted, the piping loops are manifolded together, brought into the structure and closed. The argument for this type of ground-loop heat exchanger is that because the piping is in the deeper ground – unaffected by surface temperatures – performance will be higher. Generally, installed costs are higher than with a horizontal loop. Horizontal loops are the most common loop when there is an adequate amount of land available. In this application, trenches are dug approximately six to eight feet deep to accomodate the piping. The trench lengths can range from 100 – 300 feet, depending on the loop design and application. In horizontal loop installation, trenches are dug, usually by a backhoe or other trenching device, in some form of horizontal configuration. Various configurations of piping are installed in the trenches. A larger number of horizontal loop designs have been tried and utilized successfully by the industry. While installed costs have been lower, horizontal loops have been thought to be less efficient than vertical loops because of the effect of air temperatures near the surface of the ground. If a 1/2 acre, eight to ten foot deep, body of water is within approximately 200 feet of the home, a pond loop may be used. Coils of pipe, typically 300 – 500 feet in length, are placed in and anchored at the bottom of the body of water. Currently, in most communities, tubing with an antifreeze solution in a body of water (such as a pond that is not man-made) will require special permitting and/or approval from the community. The SlinkyTM ground loop, developed by the International Ground Source Heat Pump Association (IGSHPA) represents a good compromise between performance and installed costs. While perhaps not quite as efficient as appropriately sized vertical ground loops, it represents an improvement over other horizontal loop configurations and is less expensive to install. Massive quantities of pipe – 700′ to 1,000′ per ton of unit capacity – are utilized in the SlinkyTM configuration. IGSHPA’s design utilizes 1,000 feet of pipe in an 80′ trench per ton of unit capacity. An open loop is a loop established between a water source and a discharge area in which the water is collected and pumped to a GSHP then discharged to its original source or to another location. The piping for such configuration is open at both ends and the water is utilized only once. Examples of such loops are: systems operating off wells wherein water is pumped from a supply well, through the unit and discharged to a return well; open systems operating from such surface water sources as ponds, lakes, streams, etc, where the source water is pumped to the unit and returned to the source.